Analysis of poliovirus recovered from the stool of a patient with fatal poliomyelitis revealed that she had been infected with the virus 12 years earlier, probably when one of her children received the oral poliovirus vaccine. This case has the longest known incubation period for vaccine-derived poliomyelitis, and highlights our still rudimentary understanding of how poliovirus causes disease. The patient in this case, a 44 year old woman from Minnesota, had been diagnosed with common variable immunodeficiency (CVI) in 1991. Patients with this disease lack B lymphocytes and therefore cannot produce antibodies that help control microbial infections. For example, individuals with CVI often develop chronic enterovirus infections. Furthermore, after receiving oral poliovirus vaccine, CVI patients may shed infectious virus for long periods of time, often in the absence of clinical disease. To help control infections, CVI patients are regularly given pooled immune globulin harvested from healthy individuals. The patient’s first symptoms were cough, runny nose, malaise, and low grade fever, which resolved in 4 days. Two days later she experienced leg cramps which lead to leg weakness, a fall, and hospitalization. The weakness spread to the upper extremities and involved severe muscular pain. Respiratory failure developed and the patient died after 92 days of hospitalization. The initial mild disease, followed by neurological symptoms, is a classic course of poliomyelitis. 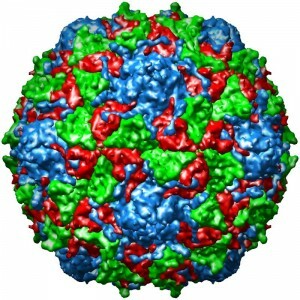 Poliovirus was isolated from a stool sample taken at hospital day 74. Sequence analysis revealed that it was derived from the Sabin type 2 vaccine strain. Because poliovirus evolves at a rate of 1% per year, it was possible to determine that the patient had become infected with the Sabin vaccine approximately 11-13 years previously. It is likely that the patient acquired the infection when her 13 year old child received poliovirus vaccine in 1995. By that time the patient had been diagnosed with CVI, and no member of her household should have received oral poliovirus vaccine. It is recommended that CVI patients and their household contacts receive inactivated poliovirus vaccine. If we assume that the patient excreted poliovirus for 11-13 years (it is formally possible that the patient recently acquired vaccine-derived poliovirus from other sources), then an interesting question is why neurological disease took so long to develop. The answer is unknown, but may be related to the fact that in healthy persons, paralytic disease only occurs in 1% of infected individuals. Why most poliovirus-infected individuals do not develop neurological disease remains a mystery. The results of experiments in a mouse model for poliomyelitis have provided some clues. In mice, poliovirus invasion of the nervous system is limited by a strong innate immune response – the production of interferons – in non-neural tissues. In addition, viral invasion of the nervous system is dependent on transport along axons, which is an extremely inefficient process. Whether the same factors limit poliovirus invasion of the human central nervous system is not known. Another unanswered question is why the patient was not protected by the pooled immune globulin which she received every three weeks. These preparations are tested to ensure that they contain a minimum titer of antibodies against polioviruses. It is possible that the amount of antibody needed to protect individuals with a chronic and acute poliovirus infection are different. Nevertheless, the administration of pooled immune globulin apparently failed to prevent the initial infection, the chronic infection, and paralytic disease. This case emphasizes the need to continue research on poliovirus. Our knowledge of how the virus causes disease is still rudimentary – as is evident by our failure to understand the 12 year incubation period of the case described here. Although the polio eradication campaign has had excellent results, it can be compromised by vaccine-associated disease. Individuals with B lymphocyte deficiencies will be a reservoir for the virus and can lead to infections if immunization levels drop. It would be highly beneficial to identify all individuals with chronic poliovirus infections, and treat them with antivirals. Unfortunately, such compounds do not exist – underscoring the need to continue research to identify drugs that can be used to treat poliovirus infection. Anti-virals DO exist. It’s called olive leaf extract! very interesting. I come from India where polio vaccination is carried out regularly. I would like to see above questions answered by the scientific community and if got a chance would like to work on them. This is a very important finding that evidences the real possibility of “chronic” enterovirus infections. Authors are referring to an immunodeficient individual. However, chronic enterovirus infections are being documented in subjects that are apparently normal in immunological terms. Two other points are worth considering: 1) why Ab titers that can protenct against acute infection may not be sufficient to protect against chronic infection; 2) the relevance of anti-enterovirus drugs, not only for plioviruses, but also for a host of other conditions. Recently, neutralizing mAbs to polioviruses have been proposed to control polio infections (Chen et al., J Virol. 2011; 85:4354-62). Antonio Toniolo, MD (Varese, Italy). both vaccines protect against the disease but not against reinfection. Is there evidence for circulation of vaccine-derived polioviruses in the US? I am not aware of any studies that have sought it. If we knew that such viruses were circulating in her community then I would agree that it is a plausible explanation for her infection. However in the absence of that data, the most plausible is that she was infected when her child received OPV. The molecular clock calculations are consistent with that view (although I realize it could be coincidental that a circulating VDPV could have evolved for that amount of time). Your statement ‘It is amazing that experts in the field forget a very old and established proof’ is condescending and unnecessary and assumes that the authors did not consider this possibility – which you do not know for sure. You are not aware because in the USA there is no an active surveillance of vaccine-derived poliovirus. Therefore, the absence of the data no necessarily reflect that there is no circulation of these viruses. So, when a clinical case happens as the one that we discuss here, the most simple explanation is the one given by the authors of the papers. The other possibility, the circulation in the community, is not investigated, only mention and they should give the same weight. Moreover, a circulation of Sabin-derived virus was detected in Amish children in Minnesota. My statement was not direct to the authors of the paper. It is to refute a dogma that you can see in many textbooks and review. This dogma is misleading and many people take for granted that if you receive OPV, you cannot be reinfected. And this kind of thinking goes against to clarify certain information regarding OPV and eradication. investigated, only mention and they should give the same weight.